Reading and share top 61 famous quotes and sayings about Motivates by famous authors and people. 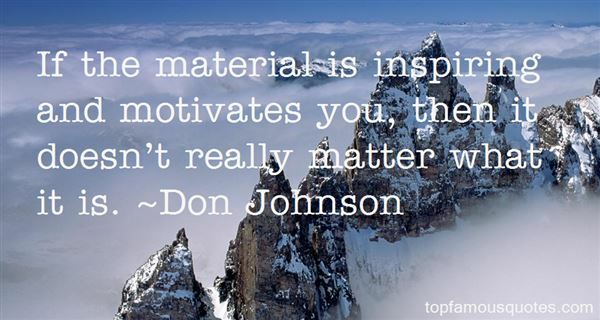 Browse top 61 famous quotes and sayings about Motivates by most favorite authors. 1. "I do not claim to have attained optimum emotional well-being. Actually, I think that may be a lifetime goal. For me it's an ongoing process that requires awareness, knowledge, and practice. I do know what good emotional health feels like, and that motivates me to keep at the practice." 2. "Real-time action of the leaders inspires the followers and the support-seeking word of the followers motivates the leaders." 3. "Love motivates self-less jealousy. God is jealous on our behalf. He is jealous for us to know the One True God. He is jealous for us to be in a posture of blessing. He is jealous for us to be kept from the evil one. He is jealous for us to be ready for our Bridegroom. Jealousy for someone's best is of God. Jealousy of someone's best is of the enemy." 4. "It's important to know what motivates you, not what motivates somebody else." 5. "Love is the bridge that leads from the I sense to the We, and there is a paradox about personal love. Love of another individual opens a new relation between the personality and the world. The lover responds in a new way to nature and may even write poetry. Love is affirmation; it motivates the yes responses and the sense of wider communication. Love casts out fear, and in the security of this togetherness we find contentment, courage. We no longer fear the age-old haunting questions: "Who am I?" "Why am I?" "Where am I going?" - and having cast out fear, we can be honest and charitable." 6. "It is exactly the fear of revenge that motivates the deepest crimes, from the killing of the enemy's children lest they grow up to play their own part, to the erasure of the enemy's graveyards and holy places so that his hated name can be forgotten." 7. "You never know what motivates you." 8. "Every run is a work of art, a drawing on each day's canvas. Some runs are shouts and some runs are whispers. Some runs are eulogies and others celebrations. When you're angry, a run can be a sharp slap in the face. When happy, a run is your song. And when your running progresses enough to become the chrysalis through which your life is viewed, motivation is almost beside the point. Rather, it's running that motivates you for everything else the day holds." 9. "Maybe I'm deceiving myself. Perhaps I don't know him as well as I'd like to imagine. What does a person so willing to utterly remake himself hold inside his heart? Can I trust such a man? What motivates him?In an instant she knew, and she felt a bit of relief.Love. Love was what drove him." 10. "The difference now is that the paparazzi get paid fortunes. That's what motivates people; it's about the money, sadly, at anyone's expense." 11. 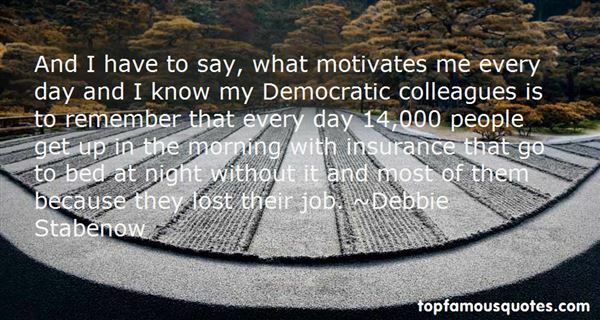 "And I have to say, what motivates me every day and I know my Democratic colleagues is to remember that every day 14,000 people get up in the morning with insurance that go to bed at night without it and most of them because they lost their job." 12. "Money motivates neither the best people, nor the best in people. It can move the body and influence the mind, but it cannot touch the heart or move the spirit; that is reserved for belief, principle, and morality." 13. "If the material is inspiring and motivates you, then it doesn't really matter what it is." 14. "I wish we could launch a ground-breaking competition that motivates kids to invent new ideas in sustainable living." 16. "True passion motivates the life forces and brings forth all things good.... desire is the poor cousin to passion, ever hungry and with no real result." 17. "If hate motivates your life, you'll never know the meaning of true love"
18. "What motivates me is seeing people in the crowd and wondering what they're going home to and what they're dealing with, and knowing that for the time being we're their escape." 19. "We change our behavior when the pain of staying the same becomes greater than the pain of changing. Consequences give us the pain that motivates us to change." 20. "To get down to the quick of it, respect motivates me - not success." 21. "My wife says I'm only comfortable when there's a fight. And it's true. The thing that motivates me is struggle." 22. "If you are a gamer, it's time to get over any regret you might feel about spending so much time playing games. You have not been wasting your time. You have been building up a wealth of virtual experience that, as the first half of this book will show you, can teach you about your true self: what your core strengths are, what really motivates you, and what make you happiest." 23. "The thing that motivates me is a very common form of motivation. And that is, with other folks counting on me, it's so easy to be motivated." 24. "I'm a person who enjoys the hands-on experience of anything I do. Get your hands dirty - that's the thing that drives and motivates me." 25. "Nothing cuts the nerve of the desire to pursue holiness as much as a sense of guilt. On the contrary, nothing so motivates us to deal with sin in our lives as does the understanding and application of the two truth that our sins are forgiven and the dominion of sin is broken because of our union with Christ." 26. "Yeah, I think it motivates you as people start to count you out. It doesn't make you play any harder, because every time you go out on the field you give 110 percent, but it does give you more of an edge mentally, knowing that you were in the same situation, because in sports you always find yourself behind." 27. "That love motivates you to cooperate, respect, appreciate, cherish, and admire that person." 28. "There is genuine Hip Hop; a message that connects, rocks a crowd, and motivates a people and then there is what is left... instead of Hip Hop we have Hip replacement." 29. "I play with a fear of letting people down. That's what motivates me." 30. "I am not a one-issue voter in the sense that indicates I am an ignorant fundamentalist who only cares about one thing. I believe in protecting the environment. I believe in caring for the poor, the orphan, the widow in her distress. These are some of the so-called "issues" that many of us use to justify voting for Obama. How can we possibly claim it is Christian love for the poor and helpless that motivates us to vote for such a man when he is so committed to the killing of the most helpless among us?" 31. "Creating awareness about what motivates us gives us the greater knowledge to choose." 32. "A true scientist is bored by knowledge; it is the assault on ignorance that motivates him - the mysteries that previous discoveries have revealed." 33. "Any belief which encourages you to use your own intellect, which motivates you to question everything and points out your own mind as the only road for your salvation is a good belief!" 34. "Every time I feel tired while I am exercising and training, I close my eyes to see that picture, to see that list with my name. This usually motivates me to work again." 35. "Your joy can be the impetus that motivates others to find their way to joy." 36. "Now the question we must ask is...what kind of _practices_ [theology] motivates, what kind of _gaze_ onto others, the guest, the new arrivant, it offers us to carry with us; _not_ who my neighbors are _but_ to whom I am being a neighbor." 37. "To love a person is to know and love the person. But we can pick up an enormous amount about another human being just by exchanging a couple of sentences. It's not yet knowledge; it's an intuition that motivates you to want to find out more." 38. "Still, being fragile creatures, humans always try to hide from themselves the certainty that they will die. They do not see that it is death itself that motivates them to do the best things in their lives. They are afraid to step into the dark, afraid of the unknown, and their only way of conquering that fear is to ignore the fact that their days are numbered. They do not see that with an awareness of death, they would be able to be even more daring, to go much further in their daily conquests, because then they would have nothing to lose- for death itself is inevitable." 39. "Rather than perceived effectiveness motivates our response to evil." 40. "I want to be a dad, first and foremost. I want to be a good father. I've spent so much of my life on the move and travelling around the world that just to set up a home for my family and be a good dad is something that motivates me." 41. "People who love us are the people who will listen and understand our juice expression, which supports our struggle, gently admonish us when we are wrong, forgive us when we fail, motivates us to optimize the potential and even more amazing is he celebrating our success as celebrating though." 42. "In parallel with the development of my interests in technical gadgetry I began to acquire a profound love of and respect for the natural world which motivates my scientific thinking to this day." 43. "Football is a great love because I was born into a family of players and therefore born into football. I'm fortunate to have a style of play that a lot of people like. It's a privilege to be able to do what I like best and in my own way, but I'm fortunate that people like it, and that motivates me even more." 44. "When our hopes for performance are not completely met, realistic optimism involves accepting what cannot now be changed, rather than condemning or second-guessing ourselves. Focusing on the successful aspects of performance (even when the success is modest) promotes positive affect, reduces self-doubt, and helps to maintain motivation (e.g., McFarland & Ross, 1982).... Nevertheless, realistic optimism does not include or imply expectations that things will improve on their own. Wishful thinking of this sort typically has no reliable supporting evidence. Instead, the opportunity-seeking component of realistic optimism motivates efforts to improve future performances on the basis of what has been learned from past performances." 45. "Rejection just motivates me to keep trying and to try to do better." 46. "I always believe someone somewhere is working harder than me and that motivates me to work harder, give 100%." 47. "Before speaking, notice what motivates your words." 48. "Many toxic parents compare one sibling unfavorably with another to make the target child feel that he's not doing enough to gain parental affection. This motivates the child to do whatever the parents want in order to regain their favor. This divide-and-conquer technique is often unleashed against children who become a little too independent, threatening the balance of the family system." 49. "It's not cruelty, maybe, but a desire to understand that motivates them." 50. "If revenge motivates you, go for it! But the main thing is to set your game in order." A quiet personality sure isn't what you need to attract attention."